Step 1. Grab some yummy jelly beans and chocolate. Cover a tray with baking paper and set aside. Step 2. In a small bowl, place the white chocolate and microwave on high for 1 minute. Stir until completely melted. Step 3. Tip the chocolate onto the baking tray and tip the tray until you have an Easter egg shape. Step 4. Sprinkle with jelly beans. Refrigerate until the chocolate is set hard. 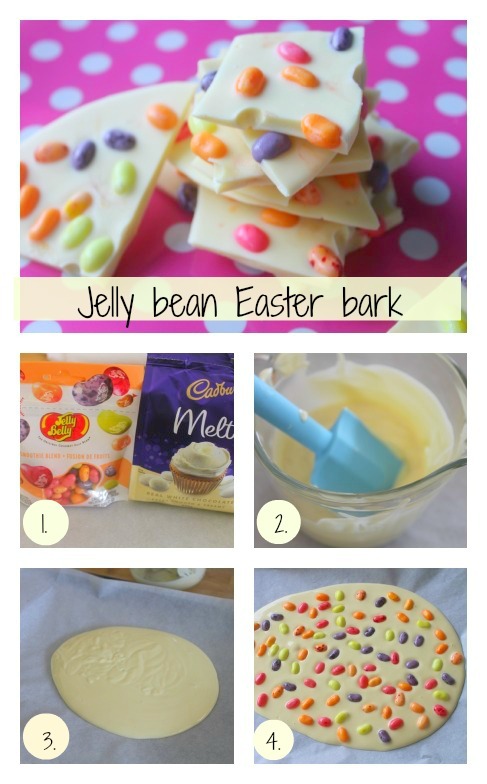 I used Jelly Belly gourmet jelly beans, smoothie blend flavour and Cadbury white chocolate melts for this recipe. Thanks to our sister company Kidspot Australia, for creating the instructional video.